Remington has been a part of PNG since 1948 providing Print and software solutions in the city of Port Moresby. DaRa was choosen as the Australian switchboard manufacturer by their electrical contractor. It all began with an pre-cursor on lead time and deadlines to export this project. DaRa was asked to complete the manufacturing of this switchboard before Christmas and set the cargo to voyage by 31st.Dec.2018 (ETA). We knew about the twin challenges on hand and went aboard to commit this project delivery in 31 days time. 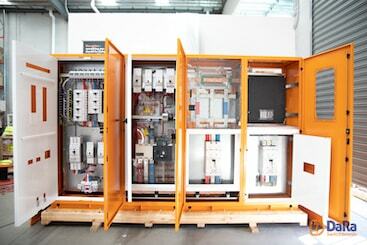 This main switchboard was manufactured using Eaton X energy modular switchboard system. We also supplied the latest generation PFC (250kVAr) for this project. Undaunted with the task to find the sailing schedules, DaRa managed to arrange export shipment from Brisbane to Port Moresby thereby passing the test of its reputation to deliver the switchboards before the scheduled time. DaRa acknowledges its strong and committed workforce for the completion of this project and a satisfied customer.